The third instalment in my Christmas gift guide series, and guess what? I'm getting blooming festive up in here. 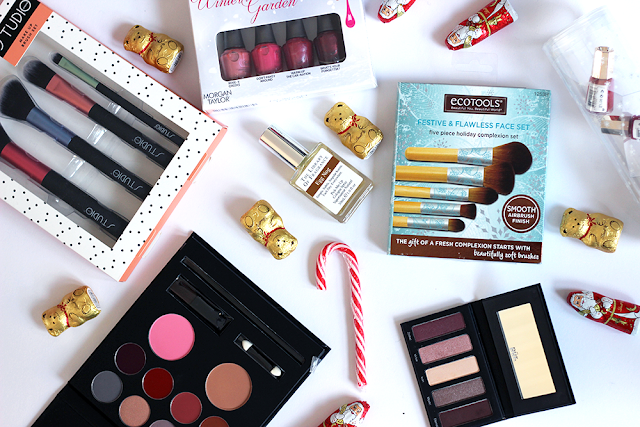 Today's post in the series is my Christmas gift guide for under £15 and honestly, some of the products and sets here blow my mind to the point where I'm so surprised that they are this affordable. I've narrowed down the best of the best bits - some of my personal favourites into this gift guide and I just can't wait to show you. 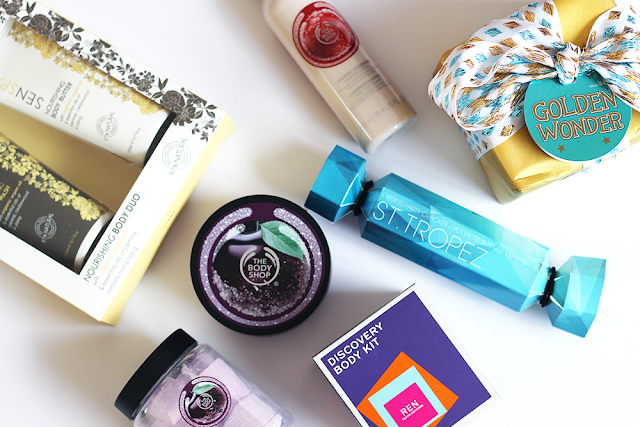 Yet again, much like in my Stocking Fillers Christmas Gift Guide post there are so many bits from The Body Shop that are so on point. I don't know, we all know I'm a little bias as it just rings so true as a brand to me, but these bits genuinely are a little bit brilliant. The Body Shop Frosted Cranberry Shimmer Lotion* is perfect for the festive season - the festive scent, the hydration and the added shimmer are just so dreamy but if shimmer isn't your or the person you're buying for's thing then The Body Shop Frosted Plum Body Butter* is ideal. The Body Shop Frosted Plum Bath Fizzers* from the same range is also worth checking out. It's a beautiful scent and I love a bath so it is the actual dream (how many times will I say that in this post?). If you love a pamper or know someone that does then there's definitely a few bits that will be right up your or their street. The LUSH Golden Wonder gift set* is filled with a couple of bath bombs in the most beautiful gift wrapping - perfect Christmas pamper necessities. If you know they love a bath then the Mandara Spa Honey Bath* is a great option also. The Ren Glow and Go* and the Ren Discovery Body* sets are a great addition too - plus they give a chance to try out such a hyped brand for a bargain price. I think these are great as Glow and Go would give you a little facial and Discover Body... well, covers just that, the body. The Mary Kay Sugar and Spice gift set is perfect for this also. The scent is stunning and includes a body lotion and lip balm which is great for just about anyone. The Dirty Works Bath Indulgence* set is perfect for a pamper and it's a blooming bargain as is the Senspa Nourishing Body Duo*. I fell in love with Senspa back when I went to visit the spa, and the brand and products just remind me of that - and I mean, if you want a pamper then a product and range resembling a spa is just what you want. Beauty gift sets are always a great option - and as you can probably tell I'm quite the fan. 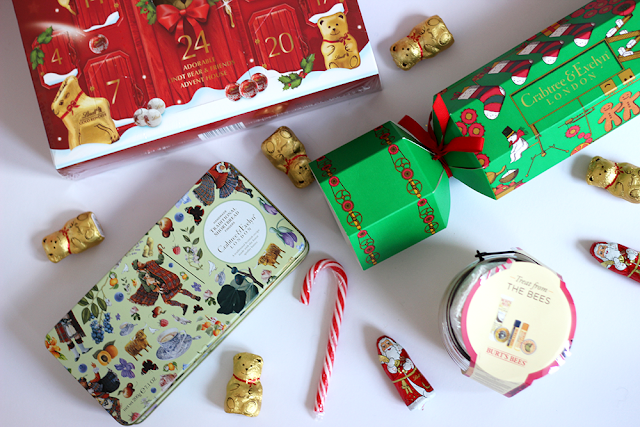 I love nothing more than browsing the beauty counters and the Christmas aisles in Boots and so I get so excited when some of my favourite brands come out with special sets - because, just why wouldn't you! The best bit for me though is some of the packaging. The Burts Bees Treat From The Bees* is a great example of this. It's in a blooming glass honey jar. It is stunning! Filled with a few of my favourite Burts Bees products this is so dreamy and a great gift for just about anyone - whether they're a beauty lover or not as it's super practical products like lip balm and cuticle butter. The Sanctuary Little Bag of Joy* is also a great example of this. It comes in a beautiful bag that can be re-used. I love this as I love using this for traveling as a makeup bag - or sometimes these are just great to have around to give things a home and keep it neat and tidy... and it's blooming cute. The Weleda Mini Gift Box in Wild Rose* is super cute, it comes in gorgeous gift wrapping. I love the brown box. Another cracker and very much one for someone who loves to tan and the St. Tropez Express Party Cracker* is filled with a mini instant tan lotion and is stunning. I've already found a home for this and they are so very excited to be getting their hands on it. For someone who looks after their hair, I'd recommend the John Frieda Luxurious Volume Set*. A perfect kit for a pamper, someone who travels a lot or just someone who likes to look after their hair. For the makeup lover then I'd recommend Pur Minerals Starry Eyed Kit* I think this might just be my favourite in the whole post. I love Pur Minerals eye shadows so much and this just blows my mind how cheap it is. A palette filled with gorgeous pinky plum shades to get a cranberry toned smokey eye and it's just dreamy. I might be a little bit in love. Another blooming great gift for a makeup lover is the Eco Tools Festive and Flawless Face Set*. Eco Tools brushes are insanely good, some of my favourites alongside Real Techniques actually and it blows my mind - along with the Pur Minerals palette - how great value this is. Top two right here. The Superdrug Studio London Makeup Brush* Set is a great addition to someone who likes makeup already as they are surprisingly great quality for the price - but also, great for someone who is just getting into makeup as it's a great amount of brushes with different uses. A great multi-use palette and another good idea for someone getting into makeup, the Sainsbury's Boutique Face Flatterer palette* is a great gift. A great all in one and I just love that. On the nail polish front I'd recommend the Mavala Snow Blossoms* set as the polishes are incredible quality and the packaging is super Christmassy or the Morgan Taylor Winter Garden Mini Nail Polish Set*. If I'm stuck for what to get someone, then I'd say I always go for Fragrance, Food and Hand Cream. A weird mix, but something from that bundle is ALWAYS a safe bet. My pick of the fragrance is the Library of Fragrance Egg Nog scent* as it's just, well, festive. This one's for someone who loves a sweet scent for sure. 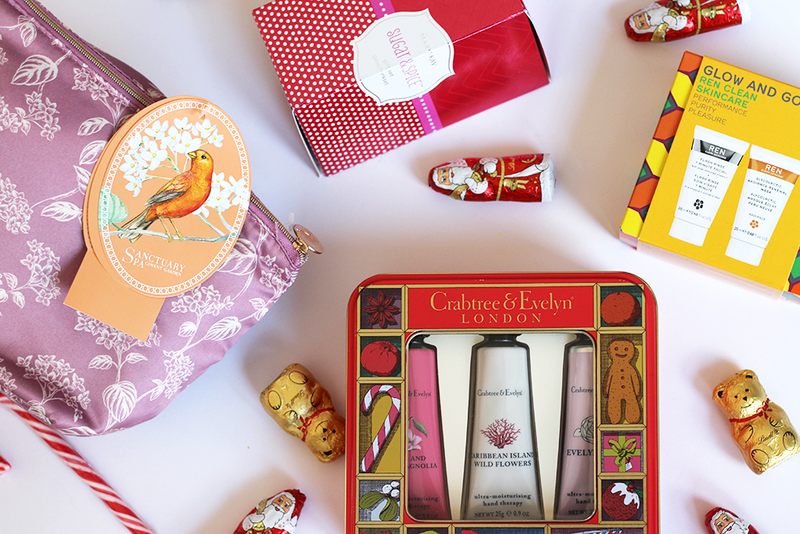 On the hand cream front, I think I've fallen a little bit in love with Crabtree & Evelyn (you'll see this when I chat food in a minute also) as the Crabtree & Evelyn Fruits and Flowers Hand Therapy Tin* is not only covered in beautiful packaging, it is also a really great product. The scents are amazing. I cant get enough of the Body Shop especially at Christmas theres nothing like it!